Last week, LiveActionNews published an article from Olivier Lindor called "Four Non-Religious Reasons to be Pro-Life". In that article, Lindor made the claim that science is all you need for the pro-life argument. Philosophy is (presumably) unreliable as a source of truth. Science is the only reliable source of truth, so science should be the standard we turn to when we make public policy. He gave three other arguments, but my purpose for this article is to specifically respond to Lindor's first argument from science. To be clear, I enjoy LiveActionNews. This is not a diatribe against them, but merely my intention to respond, as a pro-life educator, to an idea that I find detrimental to the pro-life argument and worldview, in general. Lindor is right that there is a significant non-religious portion of the pro-life movement. He is also right that we do not have to specifically present a religious argument to justify the pro-life stance. However, he does not have to throw philosophy under the bus to do so. Lindor asserts that while personhood is an abstract concept, life is not. But this is mistaken. Life, too, is an abstract concept. After all, you can't point to life anywhere and say "there it is; that is life". You can point to living things, that is, things that instantiate the property of "alive", but you can't point to life, itself, as you can point to a human being. Life, too, is an abstract concept. It just so happens that scientists have a list of criteria that make a living thing alive, and human beings, as scientists have discovered, fit the bill from fertilization. Second, in saying that personhood is an abstract concept but life is not, and that there is undisputed science regarding when human life begins, Lindor seems to be saying that philosophy is unreliable in giving us truth. But why believe a thing like that? Take the abstract concept "triangularity". There is no dispute that a triangle is a polygon with three sides and three angles. While there is a debate about whether or not abstract objects exist in reality (I'm a realist when it comes to abstract objects), there is no debate that any polygon with three sides and three angles is a triangle. Similarly, just because personhood, like life, is an abstract concept doesn't mean there cannot be a consensus on what personhood is. Additionally, as I have just shown, life is an abstract concept and there is scientific consensus on when human life begins. Just because there is disagreement on what personhood actually is does not mean there is no right answer, just as the fact that there is disagreement over whether or not abortion is morally permissible means there is no right answer. Finally, another major problem with this view is that it leads to extreme pacifism. If all that is necessary in the moral equation is that they are biologically human, then we cannot justify killing anyone, even in self-defense. How does Lindor get from "this entity is biologically human" to "we cannot kill this entity"? Science is descriptive, not prescriptive. Would Lindor oppose removing a brain-dead person with no hope of recovery from life support? He would have to, given his argument. You just can't derive a system of ethics from science. That requires philosophy. So I definitely appreciate Lindor's wanting to take a stand against abortion, and I appreciate his desire to make a non-religious case against abortion. I would just suggest he not disregard philosophy in doing so. Bill Nye (AKA The Science Guy) is famous in the US for promoting science and he recently produced an ‘educational’ video where he defends abortion and claims to debunk prolife arguments against abortion. Nye talks a lot about facts, which is strange because, last time I checked, he was a trained Mechanical Engineer and not qualified to contradict what Embryologists actually teach about when human life begins. So to demonstrate why Nye does not in fact present anything near a challenge to the prolife position I will go through his key statements point by point. Yes, it is true that more eggs are fertilized than grow to human maturity but it would be wrong to finish there. The fertilization process, when finished successfully produces a new, whole, distinct, and growing human life. But when the sperm and egg unite they do not always produce a viable human life. In some cases they can produce non-viable human embryos or non-human entities like hydatiform moles. What this means is that the fertilization process sometimes goes wrong. However, that does not mean that those embryos that did not implant or died shortly afterwards were not human to begin with. We were all once embryos. That stage marks the earliest of our human development because we do not develop into humans but as humans. Any Embryology textbook will tell you quite clearly that the creation of a new embryo marks the first stage of the human journey. You were once an embryo. So was I and so was Bill Nye. Nye simply begs the question by asserting that the embryo must be in a hospitable environment to be human, one’s environment has nothing to do with what kind of being one is. As a scientist he should know that one’s environment does not determine one’s species, nevertheless, he seems undeterred in making erroneous claims. In some parts of the world new-born infants die at alarmingly high rates. Are we to assume they aren’t human? Like others before him Nye confuses the distinction between the beginning of a human life and the beginning of pregnancy which are defined differently, only the latter beginning at implantation. What do rights have to do with science? Where is Nye discovering these human rights from? Are they hidden in the human ear somewhere? Nye seems to be conflating a number of issues, such as what it means to be human and what it means to have rights (natural or legal, you may ask). You’d think he would answer the scientific question before he steps into the realm of philosophy, another area I’m not sure engineers get much training in. Even the infamous Peter Singer admits that the embryo is a member of the human species, so let’s just answer the easy question first. The embryo is human. After that we can start getting into whether they possess rights or whether others have any duties towards them. Surely one only needs to be human to possess at least some human rights? Unfortunately, Nye doesn’t offer an argument on this, he merely asserts. I’m not sure anyone is sure what Nye is referring to in regards to imprisoning or suing people if we treat embryos as the humans they are. Having a miscarriage is tragic and has nothing to do with the intentional act of killing an unborn human being. The more Nye speaks, the quicker it becomes clear that he doesn’t really know what he is talking about and is just hoping that people believe him because he’s famous. I feel I should offer a little more clarification (since Nye doesn’t). Using the term ‘fertilized egg’ is a misnomer since the egg and sperm proper no longer exist once the embryo does. Biologically speaking it’s about as accurate as referring to an infant as a fertilized egg. Let me be clear, Nye is asserting that the new embryo is not human and yet embryology textbooks consistently says stuff like this: ‘The development of a human begins with fertilization, a process by which the spermatozoon from the male and the oocyte from the female unite to give rise to a new organism, the zygote.’ – (Sadler, T.W. Langman’s Medical Embryology. 7th edition. Baltimore: Williams & Wilkins 1995, p. 3). Of course, what does the writer of one of the world’s leading Embryology textbooks know? As Nye says he must just be reflecting a deep scientific lack of understanding. Obviously you have to ignore the irony of a man of European descent displaying his views about abortion whilst telling men not to communicate their views an abortion. It’s also ironic that an all-male Supreme Court decided for Roe in the infamous Roe v Wade case in 1973. I hope Nye will join me in campaigning for this example of male patriarchy to be overturned! Oh no, you didn’t! Nye seems to think that only European men who believe the Bible are against abortion. Unsurprisingly, he is mistaken. Women actually make the same prolife arguments men do because arguments don’t have genders. You also don’t need to believe the Bible to know that abortion is wrong, any more than you need to believe the Bible to know it’s wrong to strangle an infant. I think Nye should spend a few hours reading the Song of Songs. Nowhere does it say that we ought to believe that every sexual act must always produce children. I’m not sure what point Nye is trying to make because I’m not quite sure how making it illegal to intentionally kill your unborn offspring is consistent with ‘nature’. I would tell you what he means by nature but he never tells us. I must admit, like Bill, I’m struggling to not get frustrated. Why does nobody like abortion? What other ‘human rights’ are there that nobody likes? Of course you can tell someone what to do. Nye is doing it right now and our parents, colleagues, and governments do it every day. Would Nye never tell anyone it’s wrong to steal, cheat, harass, bully, or assault anyone? If something is morally wrong, we ought to encourage people not to do it (e.g. drunk driving). Once again demonstrating his question begging case against the prolife view, he simply assumes without basis that the unborn are not human. We have to remember that women don’t know they are pregnant until after implantation. So Nye’s earlier argument about the early embryo is a red herring because he has offered no argument against the later embryo or fetus not being an individual human who is a bearer of rights. He thinks it’s okay to kill the unborn if you don’t like the father. Would that be acceptable after they were born? Oh no, of course not, because infanticide is much harder to hide and much harder to use bad science to defend. For that, you just need bad philosophy. So as you can see, it’s the prolife community who doesn’t understand science. What do prolife philosophers or embryologists know when you have mechanical engineers to show you how it is. Clearly it was too much work for Nye to engage with the arguments prolife philosophers actually make. Instead he opted to ignore the work of those like Robert P. George, Patrick Lee, Christopher Kaczor, Stephen Schwarz, Francis Beckwith or any number of others. In conclusion, Bill Nye hasn’t debunked anything, instead he has demonstrated that he doesn’t understand the prolife argument and is ignorant of the basics of modern embryology. Happy to clarify anything and look forward to your thoughtful comments. This post was originally posted at the Failed Atheist Blog. Special thanks to Dave Sterrett for the free copy of the book to review. There are a lot of great books out there defending the pro-life position. 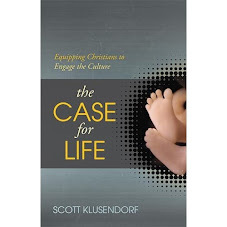 There are also some great books to help you get started in pro-life apologetics. 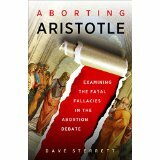 Dave Sterrett's book really functions as a pre-starter book, whereas in introductory books the information you learn about are the basics that you need, Aborting Aristotle gives a grounding, the sort of metaphysical basement, for our pro-life views. You won't learn how to defend the pro-life view, that's not its purpose. 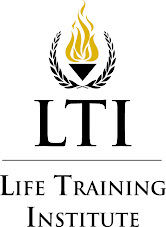 You'll learn about why the pro-life position works and why pro-choice thinkers fail to justify abortion by jettisoning an Aristotelian framework. There is a lot of great information contained in this book. His discussions on how naturalistic metaphysics is self-refuting is especially important to understand. His chapter on personhood was also very good. Usually discussions of personhood certain around who counts as persons, but it seems that rarely do these discussions get to the heart of what the concept of "person" actually means. Sterrett shows admirably that our personhood, while different than our humanity, cannot be separated from it. He even talks about some common ground that we can find with pro-choice people in his concluding chapter, which is an excellent thing for pro-life people to keep in mind when talking to pro-choice people. 1) There was no real discussion about substances and why humans count as substances. It really seems like you'd need at least a basic familiarity with Aristotle in order to know what he's talking about, even in his excellent rebuttals of naturalistic philosophy. 2) There was no real discussion about potentiality and actuality. It was mentioned, but not really discussed. This does seem like a glaring omission, since not knowing what potentiality actually means leads even modern philosophers to make bad arguments against the personhood of the unborn. Two examples are when Michael Tooley, in his book Abortion and Infanticide, argues about injecting a rationality serum into cats, and when Singer, I believe in his book Practical Ethics, argues that potential presidents don't have the same privileges and duties as actual presidents. If Sterrett does a second edition, I think a chapter on potentiality vs. actuality would be in order. 3) The 17.00 price tag is a bit steep for a 120-page book. Granted, this is not the fault of the author, the publisher sets the price tag. There are a couple of other minor issues that should probably be corrected for future editions. In at least a couple of the chapters, I felt the endings weren't tightened up. They seemed to just end abruptly. Additionally, for many of the quotes regarding Aristotle, he used secondary sources, not the primary sources, themselves. This may affect credibility. I am an Aristotelian/Thomist in my view of metaphysics. As such, I think this is an important book to add to the discussion. It's a helpful primer on the metaphysical grounding of the pro-life position. I've seen a video being shared on Facebook from a website called Big Think, in which Bill Nye (heralded as "The Science Guy" because he plays one on TV) condescendingly tells pro-lifers that we should not tell women what to do, and that the pro-life position is based on "outdated" science. That is, the science that Alan Guttmacher, in 1933 said is "so simple and evident that it is difficult to picture a time when it wasn't part of the common knowledge" (see Life in the Making: The Story of Human Procreation). The science that every embryology textbook of the 20th and 21st centuries supports. This science is "outdated" to Bill Nye. Perhaps most egregiously he tries to pit science against religion in this video, which belies a severe ignorance of how science actually developed. Let's take a look at Bill Nye's "scientific" claims against the pro-life position. He also tries to deny abstinence education works and a few other things, but they are not related to his scientific claims. So I will not address them here. He starts off by saying that many more human eggs are fertilized than become humans. This is true. Many become choriocarcinomas, or hydatidiform moles, or other non-human entities. But this doesn't show that human beings are not human from fertilization, all it shows is that something can go awry in the fertilization process and create a non-human entity, or a human entity that won't survive very long due to a severe defect. Next he says that the sperm fertilizing the egg is not all you need. You also need to attach to the uterine wall. However, Nye is incredibly vague here. What needs to attach to the uterine wall? The fertilized egg does. But fertilized egg is a misnomer. Once the egg is fertilized it becomes a zygote, an early embryo. It's the embryo that needs to attach to the uterine wall. What is the embryo? Nye doesn't even begin to talk about it. Once the embryo is fertilized, it is a new, genetically distinct, whole human organism. Attaching to the uterine wall is essential for the embryo to continue developing, but the embryo's life doesn't begin at implantation, anymore than the fetus' life ends at birth. After that, Nye asks if we grant personhood rights to the unborn entity from fertilization, then whom are we going to imprison? It's actually a half-question. Is he insinuating that we should lock up women because not all of their embryos implant? Why on earth would we do that? The woman isn't responsible for that. We only lock people up if they are responsible, whether knowingly or if they should have known, for a crime. Nye says this results from a deep lack of scientific understanding, but as is evident from the video, Nye fits this description, not pro-life people. That's all I'll really say on the video. Nye's other claims are just as bogus as his scientific ones in this video, but I wanted to focus specifically on the scientific claims, since Bill Nye is held up as a knowledgeable scientist and his claims are being shared around Facebook uncritically. We should always check the facts, no matter who it is that is doing the speaking. Pro-life people aren't out to tell women what to do with their bodies. We are only out to make the very modest claim that human beings are human from fertilization, and to kill them unjustly is immoral and should be illegal. As philosopher Christopher Kaczor points out in his book The Ethics of Abortion, once we ask the question if all human beings are persons we already philosophically entertain the premise on which the question is based. “Indeed, in answering this question, one presupposes or reinforces at least implicitly a general theory of personhood.” The idea being entertained is that a being can be a living human organism and yet lack certain capacities that would make that organism a person. Additionally, only persons have rights. There are sophisticated defenses of this position (e.g. Michael Tooley, Peter Singer, and David Boonin) as well as criticisms of the personhood theory (e.g. Kaczor, Francis Beckwith, Patrick Lee, and J.P. Moreland), but one of the principle problems with performance accounts of human value is who gets to decide what capacities or traits are necessary to be considered a person. Only persons can be wronged. Once you give authority for one group of human beings to categorize another group as not persons, you give them the authority to say that there is nothing that violates the rights of those other humans. Non-personal humans are simply not subjects of moral consideration. I hesitated for a moment and told her, “I’m going to put this up, but this could get interesting from a philosophical perspective.” The class looked confused at my comment. “And there it is,” I said. The room was silent and still. John Rawls once wrote that he always took for granted that the people that he was reading were smarter than him. If not, then why on earth was he reading them in the first place. I mention that because I read Arthur Caplan, the head of medical ethics at NYU, precisely because he is a smart man. I often learn something when I read his work though I disagree with him on important issues. His newest offering in Forbes criticizing Senator Marco Rubio’s arguments about when human life begins during a television interview with CNN TV personality Chris Cuomo is a disappointing exception to that rule. The editorial is entitled "Marco Rubio and The GOP's Dangerous Misconception On When Life Begins." There appears to be so much to immediately challenge in this article that it is difficult to know where to start. Owing to that, please forgive the length of this post. Who is “they?” This is an article addressing the specific arguments made by Senator Rubio. When you begin by shifting gears into an act of poisoning the well while dragging in the always easy to disparage “they” you are setting the bar low from the outset. We will have to wait another two paragraphs to actually address the arguments made by Senator Rubio because Caplan has a little more pre-argument work to do. Before we discuss when the life of an individual human organism begins it is important for you to know that Senator Rubio and the rest of THEM want to force mentally ill 12 year old women raped by their predatory fathers to have babies. He also has a list of other consequences that arise should any reader accept that Senator Rubio’s argument is scientifically correct that run the gamut of fear mongering (the end of fertility treatments!) to ongoing issues of debate (the end of embryonic stem cell research) to quite honestly puzzling as to why it is problematic (if you murder a pregnant woman you will be culpable for two murders). In spite of the fact that all of these issues have been openly argued and discussed for years, Dr. Caplan hints that political defenders of an inclusive view of human value either have not thought about this or are purposely not mentioning it. Now we finally get to his position. "Science supports no such view that life begins at conception." His arguments in support of this position are (1) that conception is a fuzzy concept and hard to nail down as a distinct event, (2) the majority of conception events do not produce a viable pregnancy, (3) twinning and recombination raise troubling questions about the nature of early life, (4) and a number of post implantation pregnancies spontaneously miscarry. "Is conception when a sperm reaches an egg, when it penetrates the shell of an egg, when genetic recombination begins, when a new genome is formed, or, when a functioning new genome is formed?" "It seems to me that Boonin commits the fallacy of the beard: just because I cannot tell you when stubble ends and a beard begins does not mean that I cannot distinguish bearded faces from clean-shaven ones. After all, abortion-choice supporters typically pick out what they consider value-making properties - for example, rationality, having a self-concept, sentience, or organized cortical brain activity (as in the case of Boonin) - that they justify concluding that a being lacking one or all of them does not have a right to life. But it is nearly impossible to pick out at what precise point in a being’s existence it acquires the correct trait, for example, when it becomes rational enough or has a sufficient amount of organized cortical brain activity to warrant a right to life. But it’s doubtful whether the abortion-choice advocate would abandon her position on those grounds." These two things can simultaneously be true; that Caplan is correct in the difficult nature of breaking down exactly when conception begins and that once the fertilization process is finished we have a whole, living, and distinct new human organism. This first argument does nothing to defeat the position that nascent human life, even as a zygote, is a full member of the human family. Second, he argues that the majority of conception events do not end in a human organism. His evidence of this is a study published in the journal Science that seems to show that 75% of conceptions result in chromosomal abnormalities of such an extreme nature that fewer than 30% of conception events lead to viable human organisms and pregnancy. This is interesting information, but it puzzles me as to why Dr. Caplan sees it as a defeater for an inclusive view of human value. I acknowledge that this raises interesting questions about what we know about human reproduction. Is this new life form a human organism that is suffering from such profound genetic abnormalities that his life ends very early or is it so profoundly chromosomally disordered that it is not properly understood as an organism at all? Does it have more in common with a hydatidiform mole? If the latter, then this is an interesting objection that has been addressed by Dr. Maureen Condic. (See here for more) As she points out, though these molar pregnancies have human DNA they are never whole, living, and distinct human organisms. They are not healthy human lives that degrade but begin as something entirely different and grow in accordance with what it is. We have an issue in discerning what they are prior to particular levels of development, but our lack of ability to distinguish what they are doesn’t change the nature of the life. If Dr. Caplan’s more than 70% of conception events that fail to produce whole human life fall into this category, then it is an interesting fact that in no way impacts the nature of those whole, living, and distinct human organisms that are present after the minority of conception events. “Just to reinforce the point that conception is a bad place to begin when it comes to legislating personhood sometimes, conception creates more than one life, twins or triplets, but then one of those lives is absorbed into the body of another–fetal resorption. "This conceptual question of whether an entity of that is genuinely one could be spilt so as to become two has a ready answer. Consider the parallel case of the division of the flatworm. Parts of a flatworm have the potential to become a whole flatworm when isolated from the present whole of which they are a part. Yet no one would suggest that prior to the division of a flatworm to promote two whole flatworms, the original flatworm was not a unitary individual. Likewise, at the early stages of human embryonic development, before specialization by the cells has progressed very far, the cells or groups of cells can become whole oranisms if they are divided and have an appropriate environment after the division. But that fact does not in the least indicate that prior to such an extrinsic division the embryo is other than a unitary, self-integrating, actively developing human organism." If Dr. Caplan’s argument undermines the humanity of early human life then it scientifically undermines our ability to categorize any individual planarian as an independent organism. That would be a weird leap to make without having to do so. This capacity is certainly odd, but it doesn’t do the work necessary to support Dr. Caplan’s conclusion. His final argument is that since 10% to 25% of implanted embryos ultimately miscarry then… well he doesn’t really flesh this one out. He drops it as an afterthought. He is using post implantation events to undermine the humanity of the unborn at the conception event. Why stop there? Why not drag in infant mortality rates? The mortality rate of humanity is 100% on a long enough timeline. Why not mention that? How any of these facts about the death of human life impact the question of when a distinct human organism begins to exist is beyond me, but we will just have to imagine that since we aren’t actually offered any argument. Dr. Caplan fails to make a persuasive case for his position. That isn’t so bad in and of itself, but he fails to do so while dismissing those who disagree with him as perpetuating a canard into the silence left by reputable scientist too intellectually cautious to declare when human life begins. This is uncharitable. It is also indefensible to claim such silence exists. I will include a handful of quotes to counter his claim in a postscript below on that point, but given the readily available substantive responses offered to his arguments from respected scholars his cavalier attitude on this matter is unearned. 1. "[The zygote], formed by the union of an oocyte and a sperm, is the beginning of a new human being." 2. "Although life is a continuous process, fertilization (which, incidentally, is not a 'moment') is a critical landmark because, under ordinary circumstances, a new genetically distinct human organism is formed when the chromosomes of the male and female pronuclei blend in the oocyte." 3. "Development begins with fertilization, the process by which the male gamete, the sperm, and the femal gamete, the oocyte, unite to give rise to a zygote." T.W. Sadler, Langman's Medical Embryology, 10th edition. Philadelphia, PA: Lippincott Williams & Wilkins, 2006. p. 11. My son and I were talking in the car the other day. He is 12 years old and a fine young man. The parents of his friends want their children to hang out with him because they trust him. His nickname amongst his friends is Safety Patrol. I told my son that he should feel good that his hard work on his character has built a solid reputation. I then warned him about something that defenders of Planned Parenthood certainly ought to know. A lifetime of hard work and public service can be destroyed by a few seconds of bad decision-making. If you do something bad enough, then you will always be remembered for the one bad thing that you did and not the lifetime of good. That is the way the world works, and it is fair. One of the most oft repeated defenses of Planned Parenthood is that abortion only represents 3% of what they do. The claim is misleading (see here for an explanation as to why and here for a funny video that covers it as well, and here for criticism from Slate), but what if it were true. What if we looked past the fact that 1/3 of the income of Planned Parenthood is generated by abortion and accepted at face value this claim as accurate. Abortions make up only 3% of what Planned Parenthood does and the rest of their time is spent offering productive services. We see with absolutely clarity how silly this claim is when we all accept that a given action is grossly immoral. John Wayne Gacy worked to raise money for charities in his various communities, was politically active, was a high ranking member of his local Jaycees, and dressed as a clown to entertain children at local events and parties. He also brutally raped and murdered at least 33 young men whom he proceeded to bury under his house and in his yard. No one anywhere has ever suggested we consider all the good he did, because his evil actions were of such a nature that it overshadowed any positive contributions he made to his community. We don’t have to go to that extreme. Three percent of a 24-hour day is roughly 43 minutes. What if your neighbor meticulously cared for his lawn, contributed to the homeowners’ association, led charitable efforts, and worked hard at a job that inarguably improved the community. For 23 hours and 17 minutes every day he was a model citizen, but for 43 minutes he viciously abused his wife and children. Again, no one would defend him based on the quality of his behavior over 97% of his life. The 3% of abuse is so obviously evil and condemnable that it would be the sole criteria by which he is judged, and it ought to be. Right about now the defenders of Planned Parenthood will object that abortion is not the same as serial murder or child and spousal abuse. And now we see that the defender that uses this argument is making the first mistake that most people make when discussing the issue of abortion. They presuppose the truth of the position they defend without argument. I agree that abortion is unlike the two examples I offered IF…if the unborn are not full members of the human family. IF that is the case, then abortion is unlike the moral evils previously discussed and whether it represents 3% or 12% or even 100% of what Planned Parenthood does is completely beside the point. However, that position must be established by argument. It cannot be assumed. If they are fully human, then the practice of abortion, whether legal or not (see here), is the unjust destruction of innocent human life. It belongs in the category of things that you are rightly judged for based entirely on your participation in such a moral evil, even if it only makes up a small percentage of what you do. This doesn't even take into account the act of allegedly illegally selling fetal body parts to research facilities, which ought to shut them down no matter how small a fraction of what they do it is. Which brings us back to the central question of the abortion issue. What are the unborn? Post Script: The Supreme Court has consistently affirmed that it is impossible to know what the moral status of the unborn is with certainty. I reject that argument, but suppose it is true. Then it is just as likely that those who believe that Planned Parenthood unjustly destroys over 300,000 innocent human lives every year are right as it is those who reject the humanity of the unborn are right. If that is the case, then no U.S. citizen should be compelled to contribute to an organization through federal funding that is just as likely leading our nation in state sponsored homicide, as it is that they are doing nothing morally wrong.